This is part 3 of the Nabro volcano eruption reporting. Nabro is an Eritrean volcano with NO historic eruption record. 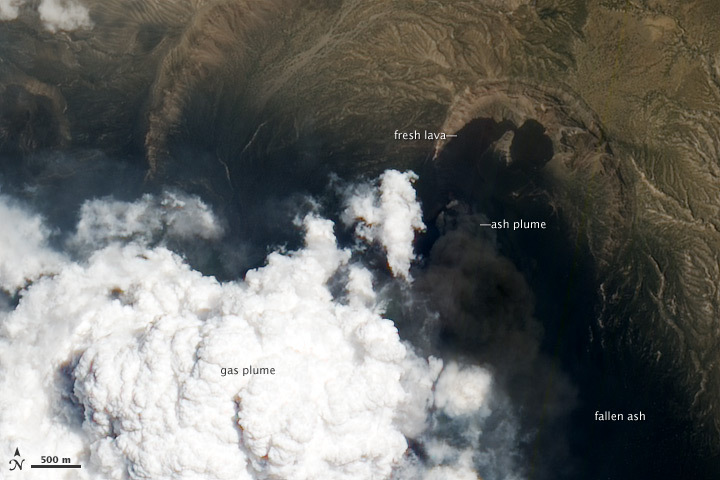 Day 6 and later were used to follow the eruption pattern (by NASA satellite images) and to continue pressuring both Eritrean and Ethiopian governments to report on the implications (damage and casualties). On Wednesday we were able to republish a portion of the TV news bulletin from Eri.TV, the Eritrean National TV station (others are not allowed). Only after 10 days became clear that 7 people were killed in Eritrea alone. After 10 days NO news yet out of Ethiopia. To read the full story as it happened, we advise our readers to start at the bottom of the page (earthquake data) and to continue going up. It will read as a written movie of the events. OGA, the Djibouti Seismological Agency reports renewed seismic activity below the Nabro volcano. Seismic activity does not mean necessarily that the volcano will erupt again (we see nothing unusual - nor visual or infrared). The picture below shows the tremors which occurred between September 9 and September 11. 3 of the 4 quakes are too deep to be related to an eventual upcoming eruption. The seismic activity continued now and then since the volcano calmed down several weeks ago. UPDATE 18/07 - 08:30 UTC : We have of course not forgotten Nabro volcano. The eruption was continuing at an easy pace with sometimes some increased activity. Since July 15, NASA SO² satellite pictures are showing no longer SO² clouds. This maybe the end of the eruption. UPDATE 13/07 - 11:37 UTC : The picture below gives an impression of the SO² gases emitted by the Nabro volcano (red and blue areas). As you can see there is still some activity, but it has subsided a lot. The images are from NASA Global Sulfur Dioxide Monitoring. Special thanks to Edward Lane for attracting our attention. UPDATE 07/07 - 22:00 UTC : What Earthquake-report.com expected from the very beginning of the eruption has sadly become true. At least 31 people lost their life at the Ethiopian side of the border. Click here for our separate article. UPDATE 02/07 - 16:32 UTC : NASA Modis trerra real colr image from this morning revealed that the activity subsided to minimal strength. Compare the pictures with the activity of the previous days (same scale). UPDATE 02/07 - 16:32 UTC : Another press release from the Eritrea government. The inhabitants of the Northern Red Sea region donated 1.2 million Nakfa in support of the displaced nationals in Sireru due to the earthquake and volcanic eruption. They made the contribution following a lecture by Dr. Gebreberhan Ogbagebriel, Dean of the Eritrean Institution of Technology, regarding the cause and consequences of the incident, as well as prevention methods of volcanic eruption. Pointing out that the support extended is in continuation of Eritrean noble culture of supporting needy fellow citizens, the donors stated that the gesture gives them moral satisfaction. It is to be recalled that the volcanic eruption that occurred around Sireru in the extreme south of the Southern Red Sea region on June 12 has caused earth tremor measuring 5.7 on rector scale. The tremor gave rise to dust that covered hundreds of kilometers which was also heard in the greater portion of the region. The displaced nationals were relocated to safe places and are in a position of obtaining the necessary care through the Government’s emergency scheme. UPDATE 01/07 - 15:18 UTC : Although the sat24.com weather satellite shows no more activity at 15:00 UTC, the true color Modis Terra satellite image from this morning is still showing activity as can be seen on the picture below. To compare the activity state of the volcano with the last couple of days, scroll down a little and compare this picture with the other similar pictures. The same scale and cut has been followed. UPDATE 01/07 - 15:11 UTC : Salt production has resumed on the salt reserve at Lake Afdera, in Afar Regional State, following the Nabro volcanic eruption that covered much of the lake and salt mine in volcanic ash. As a result, producers initially stopped production over fears of the salt being contaminated by sulphuric acid. A team of experts from the Ministry of Health (MoH) along with geologists were dispatched to assess the situation in the area. Yet, the Afdera Salt Producers Association (ASPA) confirmed that production has resumed. UPDATE 30/06 - 23:09 UTC : New press release from the Eritrean government published today. Although the text is more like a propaganda pamphlet, we thank the Eritrean government for informing us. Assab, 30 June 2011- The displaced inhabitant of Sireru due to the earthquake and volcanic eruption that occurred in the southern and south-western parts of Southern Red Sea region on the 12th and 14th of June said that even though the melting of rock is continuing, no accident is witnessed on human or animal lives thanks to Government efforts as regards providing the necessary care. They told ERINA that they were rescued from the natural disaster because of the Government’s swift emergency measures. The nationals were relocated to safe place. Reports disclosed that though the speed of the melting lava in Sireru has slowed down, about 20 meters of land area covered by vegetation is being destroyed and river beds are covered within 24 hours. Besides, in some places the lava has covered an area of about 4 Km. wide and 20 meters heigh. Moreover, the local inhabitants said that thick emission of smoke was witnessed from new lava eruptions in South Denkalia, Husele and Gagun on June 27. Likewise, emergency of volcanic eruption committee formed from various ministries and other government agencies have visited displaced nationals in Hawra and Wadien, in addition to holding discussions with the displaced citizens as regards provision of necessary relief supplies. UPDATE 30/06 - 22:14 UTC : Check the new NASA pictures in our separate article. UPDATE 27/06 - 22:35 UTC : Here is NASA Earth Observatory again. Impressive detailed views of erupting Nabro volcano. 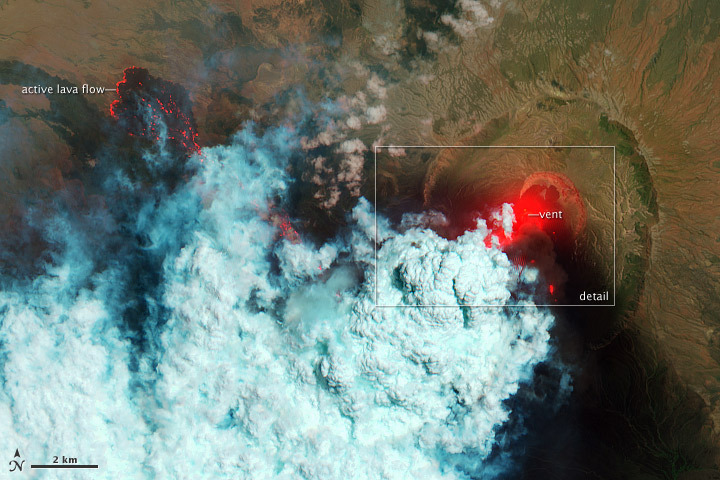 Satellite remote sensing is currently the only reliable way to monitor the ongoing eruption. 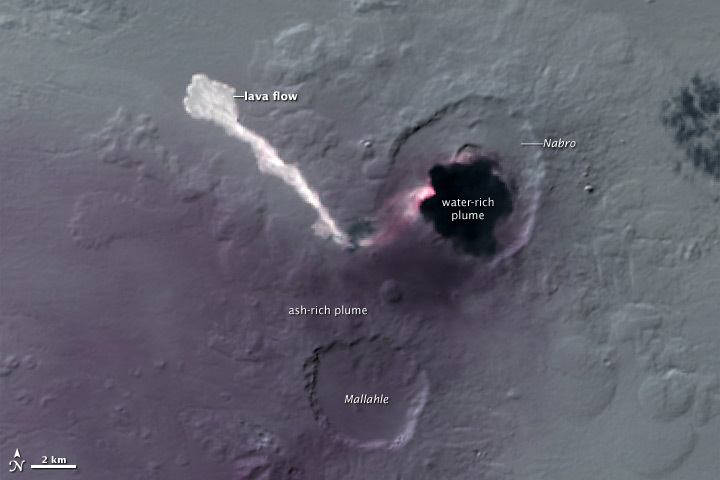 This pair of satellite images are among the first detailed pictures of the erupting vent and lava flows. They were acquired by the Advanced Land Imager (ALI) aboard the Earth Observing-1 (EO-1) satellite on June 24, 2011. The bright red portions of the false-color image (top) indicate hot surfaces. Hot volcanic ash glows above the vent, located in the center of Nabro’s caldera. To the west of the vent, portions of an active lava flow (particularly the front of the flow) are also hot. The speckled pattern on upstream portions of the flow are likely due to the cool, hardened crust splitting and exposing fluid lava as the flow advances. The bulbous blue-white cloud near the vent is likely composed largely of escaping water vapor that condensed as the plume rose and cooled. The whispy, cyan clouds above the lava flow are evidence of degassing from the lava. UPDATE 27/06 - 12:05 UTC : Modis terra satellite image from this morning (UTC). Read also our article "Predicting sites of new volcanic eruptions in the Afar region (Ethiopia and Eritrea)"
UPDATE 26/06 - 20:51 UTC : Another Press release from the Eritrean government. We bring it to our Eritrean readers as it was published. The inhabitants of Tio have extended over 70,000 Nakfas and 42 thousand in material assistance to the nationals demobilized due to the recent volcanic activities around Sireru, Southern Denkel. On the occasion, the inhabitants said that it is one of the cherished values of the Eritrean people to provide assistance to fellow nationals who have fallen on hard times. Meanwhile, the inhabitants of Edi have also pledged material and financial assistance to nationals demobilized due to the eruption. It is to be recalled that nationals who have been demobilized as a result of the volcanic activities around Sireru have been moved to a safer location and are being taken care of through the provision of basic necessities by the government. UPDATE 26/06 - 09:14 UTC : Modis satellite image from a couple of minutes ago. The volcano continues to erupt at full strength (although a lot less than the first 2 days). As this is a moderate resolution MODIS TERRA visual satellite picture, the haze comes from the weather (or the dust) in the area. UPDATE 26/06 - 08:32 UTC : Press release from the Eritrean government. Nothing really new, but at least Eritrea is showing some signs of action. Probably the same happens in Ethiopia, but as they do not tell the outside world, we ought to be alerted on the faith of the Afar people living closest to the volcano. We are still convinced that most of the toxic gases and ash has been blown into Ethiopia. The Administrator of the Southern Red Sea region, Mr. Ali Mahmoud, said that concerted action is being taken to assist and rehabilitate nationals displaced due to earthquake and volcanic eruption in the area of their choice. During a visit to the displaced nationals in South and Central Denkalia, he indicated that the Government is giving top priority to the task of enabling the nationals lead a stable lifestyle. The regional Administration would also extend the necessary assistance to the affected nationals, Mr. Ali asserted. The regional Administrator also expressed condolences to the bereaved families who lost their beloved ones as a result of the natural disaster. He further urged experts to enhance research so that proper preemptive measures may be taken. The Chairman of the Southern Red Sea Regional Assembly, Mr. Ali Nur Ali, on his part lauded the urgent action taken by the Government in relocating nationals from the area of disaster and extending emergency assistance. The Acting head of Sireru administrative area, Mr. Mohammed Habena, explained that they are in a safe place and in good condition thanks to urgent assistance extended by the people and the Government of Eritrea. UPDATE 24/06 - 15:00 UTC : Besides a new Modis Terra satellite image from earlier today showing again very strong activity, no other news could be found. No pictures, no reports from scientists (unless they keep it secret), no reports from the governments, ........ We still have a hard time understanding it ! Remark Earthquake-Report.com : Besides the Eritrean government who at least published a number of press releases, we could not trace 1 single report from the Ethiopian government which describes the health of their own people. Most of the toxic gases and the ash have been blowing for 97% into Ethiopia. UPDATE 23/06 - 11:35 UTC : Our analysis tool reveals that many Ethiopians are reading this page. May we ask them to let us know if Ethiopian Amharic media have covered this eruption and if they have talked about eventual damage and/or casualties. Every information is welcome. UPDATE 23/06 - 11:35 UTC : The activity of the volcano increase a lot the last 24 hours. The activity can well be seen on the Modis Terra real color picture taken this morning UTC. The seemingly SO2 rich eruption cloud blows at least 100 km into Ethiopia in his most concentrated form. UPDATE 22/06 - 21:48 UTC : New press release from the Eritrean government. Asmara, 22 June 2011 - The Eritrean government is extending the necessary care and assistance through relocating to safe place for nationals displaced due to earthquake and volcanic eruption that occurred in southern and southwestern parts of Southern Red Sea region on the 12th and 14th of June. UPDATE 22/06 - 13:18 UTC : Chris Rowan from the website "Highly Allochthonous" wrote a very interesting article explaining the seismic activity which preceded the eruption. We advise people who want to find out what happened to click on the link. The Great Rift Valley marks where East Africa is slowly attempting to break away from the rest of the African continent, at a rate of less than a centimeter a year. At the north-eastern end of the rift, where it links to the oceanic spreading centers in the Red Sea and the Gulf of Aden, it has come very close to succeeding, producing the Afar triangle. Low, hot and arid, and home to numerous volcanoes and ultra-saline lakes, it’s the closest thing we have to an onland oceanic spreading center – a structure that is normally found beneath 4 kilometers of water. Read more here. UPDATE 22/06 - 10:43 UTC : The video footage is part of the entire news of Eritrean TV (Eri.TV) which has been been rebroadcast by EastAfro.com. The credits for these videos are with both broadcasters. Earthquake-Report.com wants to thank them for the long awaited video footage. We have replaced the initial video without audio with the new ones. May we ask some of our readers who understand Amharic Tigre, for a translation of the audio thus enabling us to share it with our international readers. The powerful volcano that erupted in the Southern Red Sea region has created a new landmass, according to the director general of Mines at the Ministry of Energy and Mines, Mr. Alem Kibreab. Mr. Alem said that the volcano spewing ash and lava has created a new land mass measuring hundreds of square metres. Meanwhile, according to reports, 7 people have died while 3 people have sustained injuries due to the eruption. The inhabitants of the area have been moved to safer locations while at the same time they’re given basic provisions. Remark Earthquake-Report.com : The press release is very general and the name of the Nabro volcano isn't even mentioned. We are happy however that a "team composed of geological and volcanic experts is conducting studies in the area". One of our main concerns is the situation at the Ethiopian side of the border. In examining the pictures from the very beginning until days after, one can see very well that the wind has blown all ash and poisonous gas into Ethiopia. We still have NO official statement from the Ethiopian government on the situation of the villages closest to the volcano. UPDATE 21/06 - 22:14 UTC : The eruption continues the same way as the last couple of days. Still NO news from the ground (except the article from the BBC from yesterday - see link below). Still NO new facts from the Ethiopian press (most of the ash came down in Ethiopia). Still NO images or videos from the current situation. Still NO assessment reports from the Aid Organizations. As for Eritrea there are no independent local journalists or foreign correspondents allowed in the country - so no coverage of the eruption in the media. There were some brief shots on local tv. International agencies (UN, NGOs) are not allowed to leave the capital, independent assessments of the situation of the people in the area or relocated by the Authorities not possible nor available. For that reason I think your website should not call upon UN but upon the local authorities to provide insight in the situation of the peoples affected (estimated at 2500) and ask for international support if needed. UPDATE 20/06 - 22:14 UTC : Although the major eruption took place in Nabro, there were small eruptions in Afambo and Sireru areas as well (source Addis Fortune). Volcanic ash from a remote area in Eritrea reaches Ethiopian skies causing not only confusion and fear, but also contaminating the air with sulphur dioxide in the areas closest to the site of eruption. The type of eruption that took place is an explosive eruption forming a pipeline structure producing different toxic gases, such as sulphur dioxide (SO2), said Gezahegn. It spewed fine volcanic ash 13km up into the atmosphere, above even the clouds. IMPORTANT UPDATE 20/06 - 19:39 UTC : A BBC article as mentioned a number of times in the comments is citing aid workers in the border area that AID is urgently needed. The local communities need food, water and other life survival material. We call the UNITED NATIONS to ACT IMMEDIATELY and to use diplomatic pressure towards both governments, so that aid can be allowed in the area or to evacuate the people living near the volcano. The cry for help from people getting sick in the area is mainly originated by the large amounts of sulfur dioxide gas emitted by the volcano. Based on our extensive following of the initial earthquakes and the following eruptions, we are convinced that this aid is necessary in BOTH countries. Earthquake-Report.com remark : Why is BBC still talking about the DUBBI volcano instead of NABRO volcano?. UPDATE 20/06 - 15:53 UTC : "According to NASA, the volcano spewed ash and large amounts of sulfur dioxide gas—the highest levels ever detected from space". The following Aura/OMI image was taken on June 17 from 10:29 - 12:09 UTC. Image courtesy NASA Goddard Space Flight Center. Click this link to to view the series of images in this website. UPDATE 20/06 - 09:36 UTC : The University of Wisconsin-Madison / Space and Engineering Center did a great job in mounting several outer space satellite pictures together to show the eruption from outer space. A sequence of EUMETSAT Meteosat-9 7.35 µm “water vapor channel” images (below; click image to play animation) was useful for following the leading edge of the volcanic plume (the volcano summit is circled on the first few images of the animation). Click here for the link to the University website and the original document. Interesting to follow is how the first ash cloud travelled over the Middle-East on to Russia. UPDATE 20/06 - 09:01 UTC : Almost no change in activity the preceding hours. UPDATE 19/06 - 21:36 UTC : According to NASA, the volcano spewed ash and large amounts of sulfur dioxide gas—the highest levels ever detected from space, according to preliminary estimates from researchers at NASA's Goddard Space Flight Center. Nabro is part of larger double-caldera structure with the Mallahle volcano to the southwest. Both volcanoes were built, like Kilimanjaro, from trachyte lavas, and later filled by eruptions of ignimibrite. Research suggests that both calderas may have formed around the same time. The volcanic range has been “virtually undocumented,” according to researchers. UPDATE 19/06 - 18:30 UTC : The OGA page reveals that some minor Nabro seismic activity started already in May. 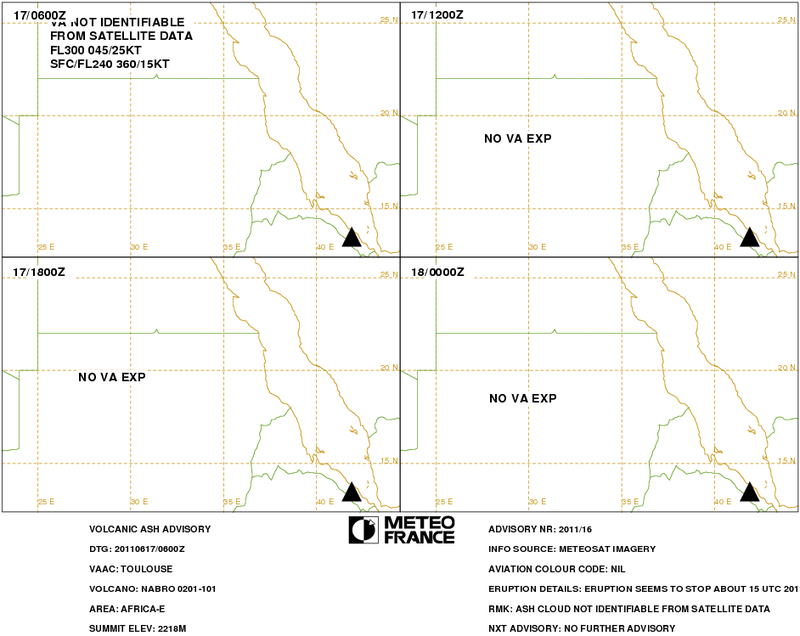 UPDATE 19/06 - 18:25 UTC : We encourage our readers who are in search of the most detailed seismic information accompanying this eruption to visit the in-depth page of the Arta Geophysical Observatory (OGA) in Djibouti, a neighboring country. Click here to view this very interesting webpage. UPDATE 19/06 - 18:20 UTC : The pictures below have been registered by the NASA Modis Aqua satellite on June 19. The ash zone extends more than 60 km into Ethiopia. UPDATE 19/06 - 10:01 UTC : As we can see on the picture below, the eruption area covers a part of Eritrea and Ethiopia. Earthquake-Reports.com hopes that both nations are setting aside their political struggles for at least a couple of weeks and will allow scientists from all over the world to examine the greater Nabro volcano area. It would be "not to understand" if both governments are continuing to block scientists from visiting the area. UPDATE 19/06 - 09:58 UTC : The red area was was earlier indicated on the NASA Modis Aqua satellite image 2011/168 recorded on 06/17 at 10 :20 UTC and projected on the Google Earth Map. The distance in between the 2 most extended points is approx. 20 km. The yellow line is the border line in between Eritrea and Ethiopia. 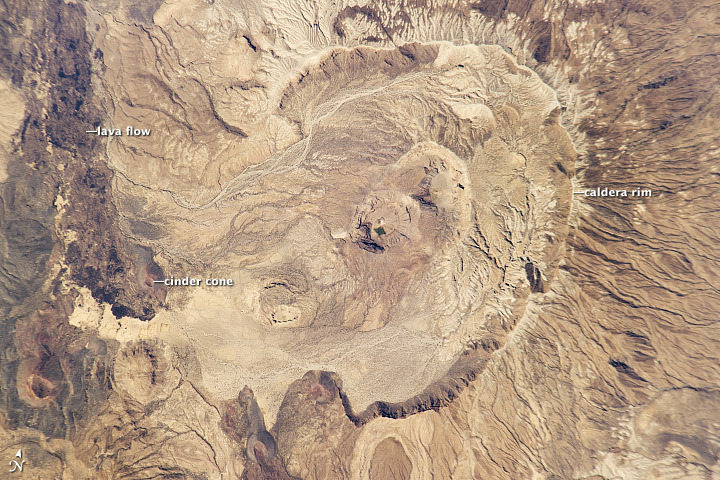 Although the crater is located in Eritrea, the actual eruption area also covers part of Ethiopia. It is hard to tell at the moment that the area was mainly covered by lava flows are are partly ash deposits. The present satellite pictures are not detailed enough to be sure. We will have to wait for satellite spot images who can give us the detail of the surface. UPDATE 19/06 - 07:30 UTC : Until last weekend, the Nabro volcano in northeast Africa looked like it does in the image below. Then, on the night of June 12, 2011, the stratovolcano erupted for the first time in recorded history. Astronauts on the International Space Station snapped this digital photograph of Nabro in January 2011, when all was still quiet. UPDATE 18/06 - 13:25 UTC : The picture below is the activity as recorded this morning at 08:00 AM UTC. As you can see there is still some activity going on. UPDATE 18/06 - 10:52 UTC : A few moments ago we received this message which we found to be trusted (for many reasons) : Im a Meteorologist in the area of this volcano and i am monitoring it on satellite and it has erupted again and is tracking south on the imagery i have. UPDATE 18/06 - 10:34 UTC : The lava field which was the result of this Nabro eruption is 20 km wide and about 10 km downwards. UPDATE 18/06 - 09:57 UTC : Further to the seismic activity around the Nabro volcano, we can report that yesterday 8 worthwhile mentioning earthquakes occurred and as far as today we have noted 4 earthquakes. No visual activity on weather satellites today. UPDATE 17/06 - 15:36 UTC : Reader David Somsen comments : I wanted to let everyone know that Ethiopian Airlines has confirmed to me (on numerous occasions, because I still don’t believe it) that tomorrow’s flights in northern Ethiopia are still canceled. Day 5 of being stuck in Gondar. Woohoo! UPDATE 17/06 - 14:40 UTC : Following the Djibouti seismological service (OGA), at least 4 M+4 earthquakes have occurred today in the Nabro volcano area. UPDATE 17/06 - 13:24 UTC : We have NO longer weather satellite visible Nabro activity. Both the visual as the infrared satellite weather images are smoke free. VAAC latest bulletin was at 06:00 UTC. The map is FREE of air traffic hindering ash clouds. Unless new elements are occurring, NO new bulletins will be published. We have checked the satellite images at regular intervals and we could NOT detect any new increased activity after the new earthquake. A volcanic activity triggered strong and dangerous earthquake near Nabro Volcano, on the border between Eritrea and Ethiopia. UPDATE 17/06 - 10:03 UTC : WAPMERR is expecting casualties in Waddi from this earthquake, with between 0-100 deaths and 30-300 injured. However, earthquake-report.com and CATDAT expect that there will be little loss of life given the activity in the area in the last 5 days. UPDATE 17/06 - 09:47 UTC : A strong M5.5 earthquake has occurred in a similar position on 17th June 2011, this is expected to also indicate volcanic activity from Nabro again. We will wait for confirmation. Armand, I have been tracking the activity as best I can in the Afar rift zone for some time. There was a report several months ago that the ground in that area is extremely hot and the heat goes all the way north to Egypt. I think that report was around the same time that Mubarak's government was overthrown. Now there is reporting on ABC News about the severe drought in Ethiopia, with refugees walking south to Kenya to refugee camps, where they are beginning to receive aid, but it's more difficult to get aid, especially food, in Mogadishu because of the local gunfire. I'd like to know if there is any connection between the rifting event going on in the Afar rift zone and the drought. Is there any way to find out if the water in the boinos has receded and disappeared? Also, is the British Geological Survey going to be able to send people into that area again? They seem to be the only people reporting on this other than your group. I looked back over my notes and found that this uptick in rifting activity started 9 months after the Dec. 26, 2004 Sumatra quake, and I'm very concerned that the increased activity may have consequences that no one is even remotely considering. Sara, the answer as far as i know is NO. The rifting is going on for very long time with the usual ups and downs. Also the weather pattern and the droughts are common if you look at them during a longer period. The drought is only a small portion of Ethiopia which has done very well the last 10 to 15 years. The main problem of the current famine is the anarchy in Somalia.